My best friend Stacy, has been telling me about this delicious rhubarb cake her Grandma Maurer makes, for the last couple months now. We finally were able to get together, so I decided to grab a couple of bags of rhubarb out of the freezer to defrost, and we make this cake! This cake is oh so bad for you with a whole pint of whipping cream poured over the top, but the end result is fabulous. I am a huge custard lover, and this cake has a wonderful creamy custard flavor. This is a new favorite right along with the Rhubarb Dump Cake I posted a couple months ago. 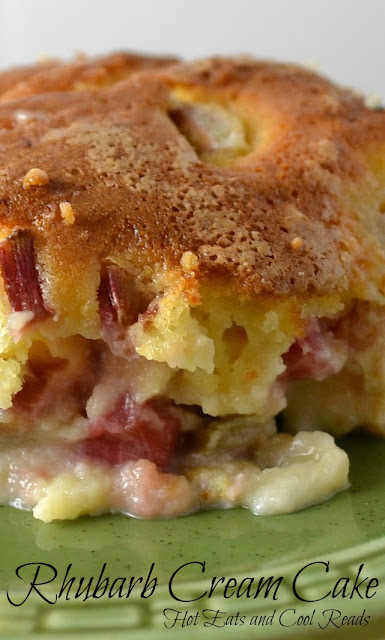 You and your family will love it, if you are a fan of rhubarb! Preheat oven to 350 degrees. Mix yellow cake mix according to package directions and pour into a greased 9x13 glass baking dish. Sprinkle rhubarb evenly over cake batter, and cover evenly with sugar. Pour the whipping cream over the top. Bake for 1 hour to 1 hour 15 minutes or until top is browned. Cool completely before serving and refrigerate leftovers. This looks like a delicious dessert. Hope you are having a great week and thank you so much for sharing with Full Plate Thursday. Thanks Miz Helen! Have a great weekend!! You will love it when you have a chance to try it! Thanks for the invite! I love rhubarb! Thanks so much for sharing on foodie friday! I love rhubarb too! One of my favorites! Thanks for hosting!! I hope you liked it Angie!! Thanks so much for stopping! Heading over to check out your blog now! It does look like one! It's so good too! G'day! Looks delight, moist and light, TRUE! Your photo makes me want to have a piece now too! I saw this at Foodie Friends Friday. Sheena this looks so dang yummy, and there ain't nothin' wrong with a whole pint of heavy cream! Looks delicious! Thanks for sharing on Foodie Friends Friday. I made this several times last summer. My family loved it and it was a HUGE hit at every potluck we went to! Fast, easy, and delicious. It doesn't get much better than that! This is the best of the rhubarb dump cakes, as far as I'm concerned. 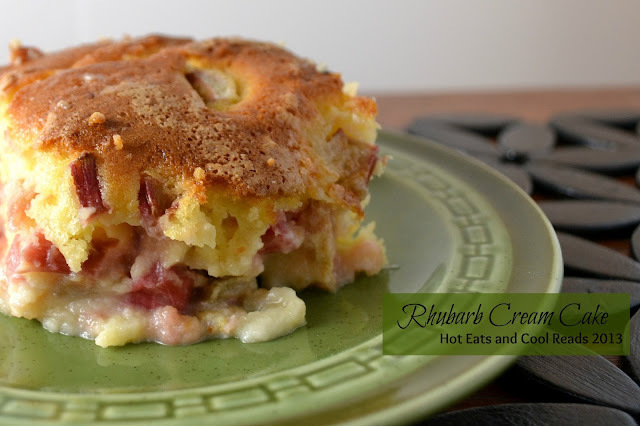 It makes a wonderful custard on the bottom with the rhubarb. Little whipped cream when served and it's the best! Okay, I used about 4 cups of frozen rhubarb (water squeezed out) and added about 2 cups whole frozen strawberries. When I served the cake, everyone was commenting how delicious it was. Then I suddenly realized that I had forgotten to add the cup of sugar per the recipe. The strawberries and cake mix apparently contained enough sweetness and I think if the sugar had been added it would have been way too sweet! Since we were serving to 5 grandchildren that evening, everyone was glad that the extra sugar had not been included!